Improved imaging provides better views of the underlying facial structures obscured by the skin or soft tissues of the mouth, and this aspect of treatment planning has been particularly instrumental in facilitating these enhanced interventions. 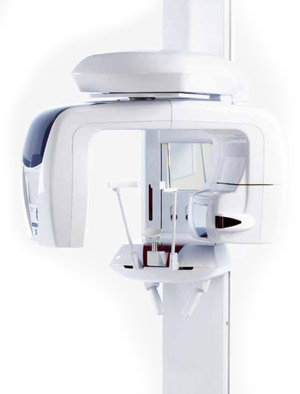 One technological tool that has given dental practitioners access to higher quality images is the three-dimensional cone beam computed tomography (CBCT) scanner. Based on the same principles as the CBCT scans used in many fields of medicine, the 3D CBCT scanners used in dentistry rely on a cone-shaped radiation beam to capture slices that are compiled into a 3D representation of the patient’s facial structures. While traditional x-rays can give your periodontist a series of two-dimensional images, those pictures may not provide sufficient data to plan for complex procedures, like dental implant placement or periodontal surgery. In comparison, CBCT scans provide realistic 3D images that capture soft and bony tissues and help the periodontist to plot the exact location in the jaw at which the dental implant will be inserted, for example. To offer our patients the advantages of the best technology available, our office has installed a state-of-the-art CBCT scanner, the Morita Veraviewepocs 3D R100. This scanner gives Dr. Karabin and Dr. Gottesman the opportunity to collect in-depth representations of various periodontal structures. Because the field of view is triangular rather than cylindrical, and more compatible with the natural shape of the dental arch, this instrument can be highly targeted to the desired area of interest, which reduces the patient’s exposure to radiation. It can be used to take panoramic views of the jaw or cephalometric pictures of the entire skull. To learn how CBCT scans can be used in planning your treatment for improved outcomes, speak with your periodontist for an overview of the technology and its capabilities.